The Paratrooper is a flat ride. It is fast, fun, rerideable, it has a large capacity, and a long duration. Just a regular paratrooper. I wish more parks had one. Excellent paratrooper and easily one of the best out there. I love the look of the ride, especially at night, and the ride comes very close to the surrounding trees. Kennywood ran this pretty quickly and there were nice sensations during the ride. It also had a long cycle as well. It is very hard to make a bad version of this ride, and this is far from bad. Nice location, good cycle add to the already enjoyable floating feeling that this ride delivers. I will refrain from my normal review since I rode this during Phantom nights. The lights and fog machine gave it an appearance it will rarely have. Saw this one at a carnival the other day, too. I know its a clssic but Im a modern guy...Definitely a 4. By the way, wheres the skycoaster so we can rate it!! Classic ride being a classic. Love breezing by the tree tops and just getting a classic amusement park feel while riding this. The way everything is set up, you feel as high (if not higher) than the nearby coasters. An awesome flat ride that is just plain enjoyable to ride. Paratrooper is just one of the many fabulous flats at Kennywood. It follows a really neat path and cools you off good on a hot day! Paratrooper is a perfect ride if you are looking for something that everyone can enjoy! This has been at Kennywood as long as I can remember, and Ive always really enjoyed it, and I still do today. 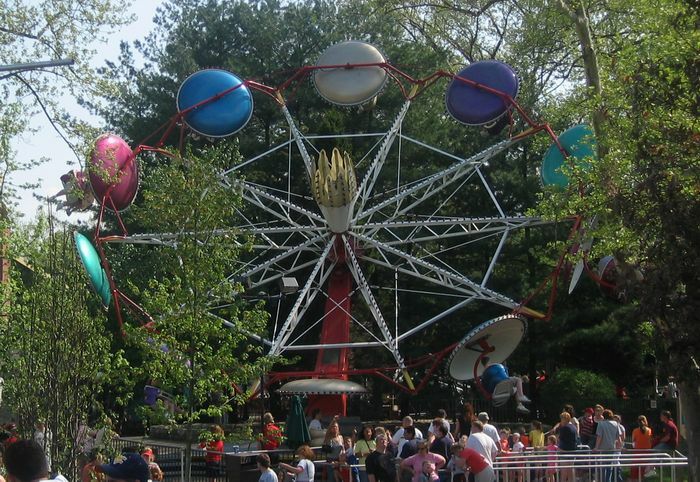 Its a simple ride - you sit in "umbrella" covered seats and the ride goes in a circle then lifts up. Just something about the rides path as you go is really neat....you kind of swing out as you head up towards the sky! Easily one of my favorites at Kennywood! !